VATICAN CITY (CNS) — Faith isn’t something learned just by studying the catechism but rather is a gift passed on to children by the example of their parents, Pope Francis said. Although children learn the tenets of the Catholic faith in catechism class, it is first transmitted in the home “because faith always must be transmitted in dialect: the dialect of the family, the dialect of the home, in the atmosphere of the home,” he said before baptizing 27 babies. “The important thing is to transmit the faith with your life of faith: that they see the love between spouses, that they see peace at home, that they see that Jesus is there,” Pope Francis said during his brief and unscripted homily. 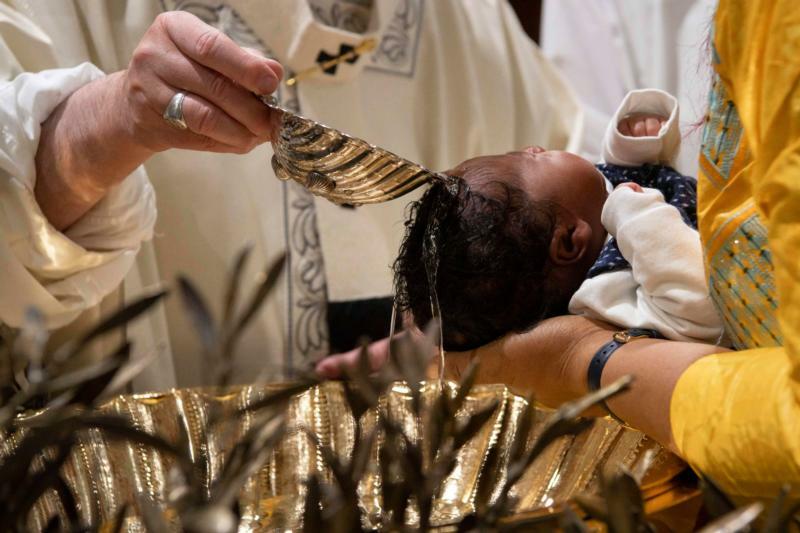 As the lively sounds of babies’ squeals and cries filled the frescoed Sistine Chapel, the pope said babies often cry when they are “in an environment that is strange” or because they are hungry. Children “also have a polyphonic vocation: One begins to cry, then another makes a counterpoint, then another and in the end, it is a chorus of cries,” he said.